Optimizing for low-hanging fruits means making the most out of a small budget. In this article, we show you how to achieve quick wins with a small budget. People who have been active in SEO for a few years will be familiar with the term “low-hanging fruit.” In this article, we show you some useful tips on how to make use of them. Newcomers will also come across the term sooner or later, whether researching or with training courses. But what exactly does this mean? What is low-hanging fruit (referred to from now on as “LHF”)? And even more importantly: can I quickly achieve success in SEO even with a small budget through LHF optimization? Especially for newcomers or companies that don’t have a big budget, these quick wins have the potential to make a big difference. We can subdivide the topic into two areas: firstly, focusing on weak competitive search terms (e.g. longtail terms), and the second on rankings between positions 10 and 20. Why? If you already rank on the second page of the Google SERPs, it’s clear that your page is relevant – even making just small improvements might help you reach the first page. Low-hanging fruit also exist outside the SEO industry. In business, the focus is on the cost-benefit ratio – achieving above-average success with little effort. This is exactly what SEO is all about: improving positions with little effort! Optimization for low-hanging fruit can be divided into three phases and can be mapped in one process: analysis, merging and hygiene, and optimization. Let’s concentrate on LHF optimizations with existing rankings. In the practical examples, I will focus on free tools; after all, low-hanging fruit is about making the most of a small budget. You should use the Google Search Console to analyze your ranking positions between 10 and 20. The Google Search Console always provides you with the most valid data and best insights. 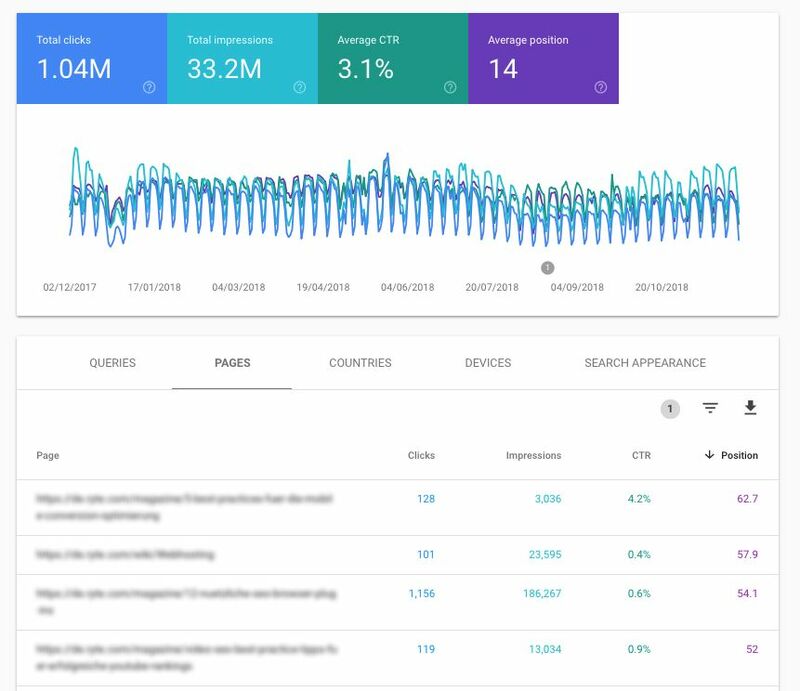 In the Google Search Console, go into the report “Performance”, and set filters for keywords in the last 12 months between positions 10 and 20. Filter in descending order. Look at the impressions of these keywords – these provide valuable conclusions about the search volume. (However, you should use the Google Keyword Planner for accurate data about the search volume of certain keywords). Now you can look at a URL that is relevant and has a lot of potential. You could also do this via “queries”, and then filter the URL directly. If you click on a URL, and then on “queries”, you can see all the keywords that rank for this URL. If these keywords are thematically suitable for the URL, you should optimize the article for these keywords. There are many different ways and possibilities to optimize keywords or topics. However, essentially you should optimize for topics, and not keywords. This means that you should always be optimizing for your user intent. You might end up optimizing 5 or more keywords pro URL. You should also be aware that different areas of business have different ranking factors. The focus of this phase is on merging and cleaning up URLs. URLs that deal with very similar topics can be “merged” together to create one piece of content. Make sure the topics are similar, and that the old URL is redirected to the new one via 301-Redirect. This avoids cannibalization of the URLs and strengthens the focus of the topic. Deleting URLs can also increase your SEO performance, but you should make sure that the URLs are redirected to a thematically similar URL via 301 status code. URLs that have not been used for years can be removed! Deleting and redirecting irrelevant URLs that do not “pay in” to your company’s goals. Merge URLs that are thematically very similar and represent an identical user intent. With the tools Google Analytics, Ryte or ScreamingFrog you can collect the data quite easily and combine them in Excel. The free version of ScreamingFrog is sufficient for small domains up to 500 URLs. Ryte also offers a free account. The last step gives you an overview of the classic possibilities in optimization. Theoretically, you could skip the second step “merging and hygiene” and start right here. But since it makes more sense from an SEO point of view to first clean up and get an overview, you avoid the danger of making work double or even pointless. The simplest measure is to adjust meta-titles and meta-descriptions. The meta-title and the meta-description are becoming increasingly relevant. This is partly due to the fact that Google has been focusing on the user intent for years, so try to use your most important search terms here and describe the topic in a meaningful way. The title should not be longer than 60 characters. A helpful tool to check this is Ryte, or the Google Snippet Optimizer. A further measure would be to adapt the headings within an article or text. Check whether the topic is sensibly described in headings, and use your semantically similar search terms to increase relevance. This can achieve quick results, especially in areas that are rather news heavy. A little more work, but definitely worthwhile, is the expansion of more content. Take your text and extend it with relevant topics. Add paragraphs that semantically fit the topic. Also check whether any featured snippets rank for search terms. If so, you can optimize your content for Direct Answers and benefit from it as well. Internal linking is still an important part of SEO, and shouldn’t be neglected. A quick win could be to increase the number of internal links to a respective URL. Use the links report in Website Success and check how many links refer to the URL to be optimized. Link the URL of other relevant pages from the content. This classifies the URL as more relevant for search engines. Optimizing your loading times is more important than ever before. Mobile indexing is also driving this topic forward. SEO aside, improving the loading time can achieve a lot. For example, it can have a very strong influence on the conversion rate. Compress your images with tinyjpg.com before you use them. There are plugins for WordPress, e.g. the EWWW Image Optimizer. Reduce, if possible, the number of requests, and remove resources you do not need. You can analyze your domain with the free tool webpagetest.org. Tip: Activate the Lighthouse Report in the settings. The activated Chrome Lighthouse Report simulates 3G connections. Ryte also offers a Pagespeed Report, which uncovers further potentials. There are also some potentials in the offsite area that can be exploited with little effort. Backlinks are still enormously important and are listed by Google as a top 3 ranking factor. Of course, the offsite area is a large field and usually requires a little more effort. Nevertheless, there are also quick wins here that can be implemented relatively quickly. Think about which cooperations or partnerships exist and analyze whether the domains link to you. High quality, relevant backlinks can be gained through cooperations in particular. In the Ryte Wiki you can find further search operators. There is also a recent article in the Ryte Magazine regarding this topic. There are many more ways you can optimize low-hanging fruit. But, for now, the measures described here will be sufficient to achieve the first successes. Depending on your objectives, you will reach your goal with a small budget. Don’t forget to monitor your success – there are plenty of tools out there, including the Google Search Console, to help you with this. Then all that remains to be said is: Have fun picking fruit! Published on 12/03/2018 by Fabian Nesensohn. Fabian studied Applied Computer Science at the Ravensburg-Weingarten University of Applied Sciences, where he discovered his passion for usability, web analytics, conversion optimization and SEO. He has been with xpose360 GmbH for almost six years, three of which as team leader in SEO. He is now Supervising Senior SEO, and is also responsible for technical SEO.